I’m honored to have been interviewed by Eric (4Z1UG) for his QSO Today podcast. The interview was posted as a podcast this week. We recorded it a couple weeks ago via Skype. My home Internet service was so terrible that day, I actually drove into town, parked in a parking lot, and used Skype via my mobile hotspot. I was pretty distracted during the interview, I’m sure, but Eric was a fantastic host. Click here for the show notes and to listen to the podcast via QSO Today. Thanks again, Eric, for including me in your excellent podcast. This entry was posted in Ham Radio, News, Shortwave Radio and tagged Eric (4Z1UG), Interview, K4SWL, Podcast, QSO Today on September 15, 2016 by Thomas. At the SWLing Post, we love radio history and that of technology in general; clearly, steps taken in our past indicate how we will blaze trails into our future. But that’s not the only reason to appreciate vintage technologies. Developed in an environment with limited resources and infrastructure, the forms these technologies often took were resultingly unique: hand-wrought, self-servicing, robust, efficient, interactive, engaging, elegant, and sometimes truly magical. In other words, an art form. 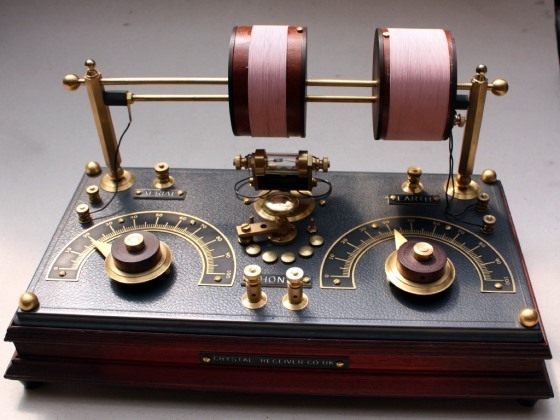 And in the world of radio, form simply couldn’t follow function more intimately than in a crystal radio. Even the name is magical, suggesting, perhaps, a receiver which culls sound waves from clear stone, or unleashes ancient voices long immured in ice. 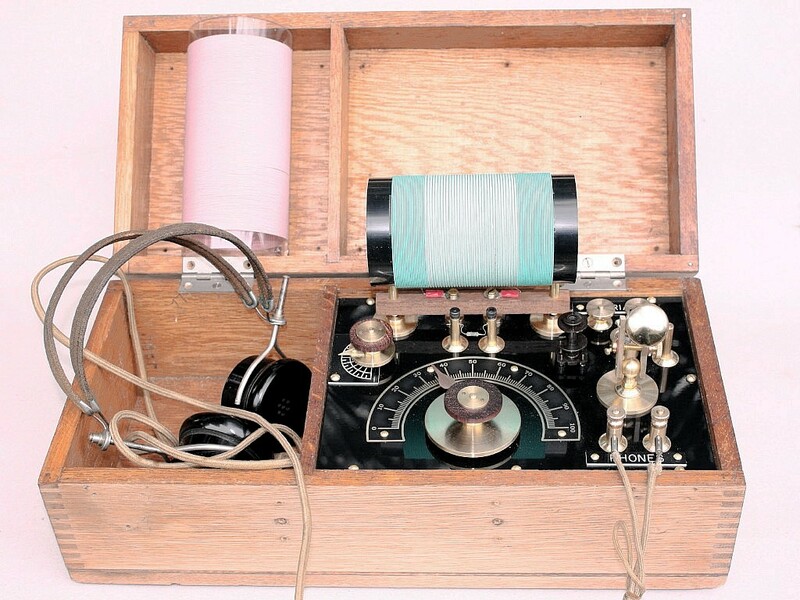 But a crystal radio has yet another mystery up its sleeve: it has no power source. These sets are passive receivers, meaning that while other radios use a power source (usually electricity) to amplify radio signals, the crystal set draws power from radio waves received via a long wire antenna. 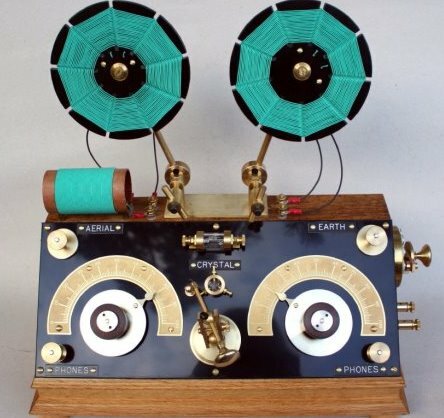 It’s the simplest type of radio receiver, and can be made from a few inexpensive parts, like an antenna wire, a tuning coil of copper wire, a crystal detector, and earphones. My first crystal radio set was made with a Quaker Oatmeal box, a bunch of wire, and a small earpiece. Nothing elegant about it, but it was nonetheless magical, as I listened to the sound waves it drew from the ether. Ultimately, all crystal radios have the same components as my oatmeal box variety–a tuning coil of copper wire, crystal detector, antenna and earphones–but fortunately not all follow the oatmeal box design. Indeed, some are worthy of an art museum, such as London’s Tate. One glance at Roberts’ collection of hand-made crystal receivers, and it’s clear one is in the presence of a remarkable artist. Indeed, his crystal sets would be absolutely at home aboard Nemo’s Nautilus or any steampunk time travel machine. They fire the imagination. It comes as no surprise, therefore, that Roberts was recently asked by the curator of the Tate Britain to exhibit his singularly fascinating works, along with those of the Crystal Radio Club, in a show entitled the ‘Restless Times Exhibition,” which commemorates the work of artisans and artists for the period between the wars of the past century (1914-1945). We simply had to know more about what makes Geoff Roberts tick, so asked him if he would allow us to interview him for the SWLing Post. He’s most kindly obliged–so with no further ado, I present crystal radio artist, Geoff Roberts. 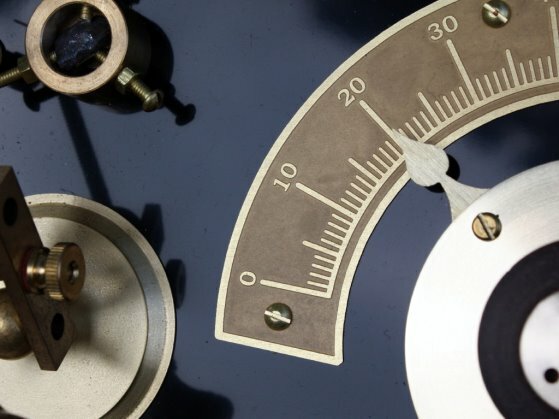 SWLing: When you design a new radio, from what–or where–do you draw inspiration? Geoff: When I’m designing a radio I have a particular circuit in mind that I would like to try out, and from the circuit diagram I can visualise what possible layout combinations it could have. The inspiration for the design is based upon a theme that I’m thinking of at the same time as the circuit, i.e., the ‘Time Machine’ or Captain Nemo’s Nautilus. 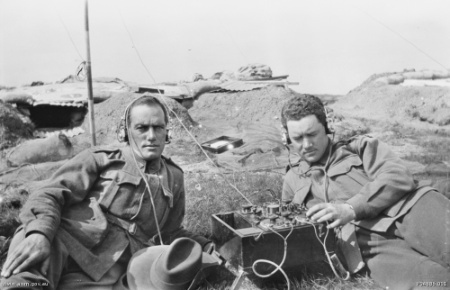 SWLing: Do you know what the radio will look like before you start building it? Do you make preliminary sketches, for example, or do you have an image in your mind? Geoff: There is no initial engineering drawing with my radios; I complete a radio before I have put pen to paper, but there may be some thumbnail sketches of various parts that make up the whole design. Sometimes if I’m having difficulty resolving an idea I sleep on it, and it is more often than not resolved by the morning. SWLing: Many of your radios are named after classic science fiction authors. Tell us about your relationship with science fiction. Geoff: I have always had a fascination for science fiction in whatever form it is, be it TV series like Dr Who or Star Trek or the classic stories by Jules Verne or HG Wells. I do not actually read many science fiction novels–I simply do not have the time–it is reserved for practical things. SWLing: So why do you build crystal sets? Why not more modern pieces of technology? Geoff: The crystal sets, to me, are a satisfying way to employ the combination of traditional hand craftworking skills and radio or electrical knowledge that I have learnt over years of practical experience. Crystal sets are a timeless electrical device that are just as appropriate today than yester year, possibly even more so in the coming ‘Green Age’ of renewable or low energy useage. 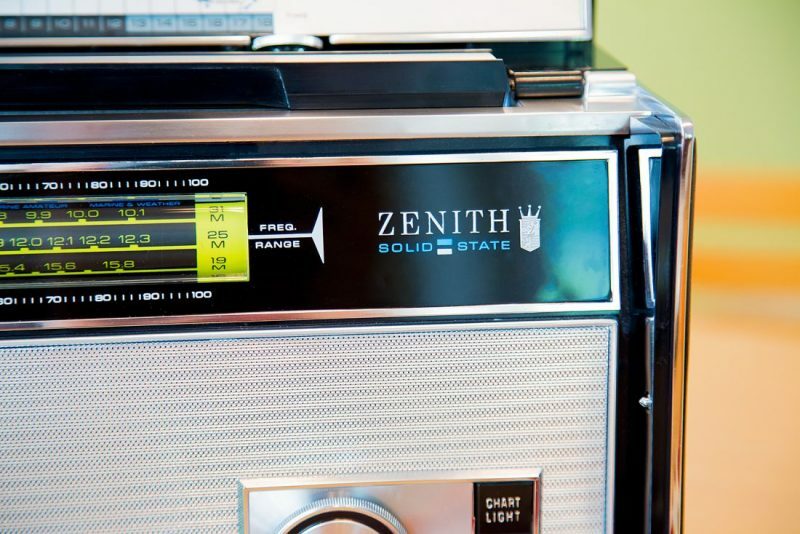 It is still an evolving technology with better components, lower electrical loss materials, and Litz wires, plus highly-tuned circuits: these were just not available to the amateur builder many years ago at the dawn of radio. I have built many modern electronic devices employing integrated circuits or transistors, but there is an increasing complexity of circuitry and miniturization that really only favors the robot and not that of a human hand. I keep coming back to a simpler, more satisfying art form that is a collectable piece of equipment, rather than a disposable one. SWLing: Tell us a little about your history in radio…when did you first become interested? Geoff: I first became interested in radio at an early age of eleven, when my uncle who used to visit us every Wednesday evening would always bring a small gift or piece of chocolate. One evening he was carrying a small oak box about six inches square. He opened the lid, and there were a few small brass parts on a black face plate. There were three labels: “aerial,” “earth,” and “phones,” and a big knob in the middle. He connected up a pair of headphones, and put a wire round the picture rail, and one to an earth stake outside just below the back room window. I was amazed I could hear voices and music. I spent most of my early youth listening to pop music from Radio Luxembourg on that old crystal set, sometimes late into the night and under the bedclothes when, unknown to my parents, I should have been sleeping. From that day onward I was hooked on radio more and more, and built my first crystal set from a toilet roll tube and wire from out of an old transformer that I found on a junk heap on waste ground nearby home. I used to cut out the capacitors and resistors and started to make up a collection of commonly used parts. By the age of 12 I had been given a Philips Electronic Engineers Kit for Christmas. This kit was really for kids to learn basic electronics by using a simple breadboard designs. One evening I built a one-transistor radio from the kit and heard two radio hams talking to each other. This was another big revelation to me in that it was possible to talk to a friend by using radio. It was not long after I had my own license to operate on the radio waves, and started a career with GPO telecommunications just after leaving school–but that is another story. SWLing: When you listen to radio–on a crystal set, on shortwave or otherwise–what stations would we most likely find you listening to? SWLing: What are your plans going forward? Do you have other radio designs in mind? 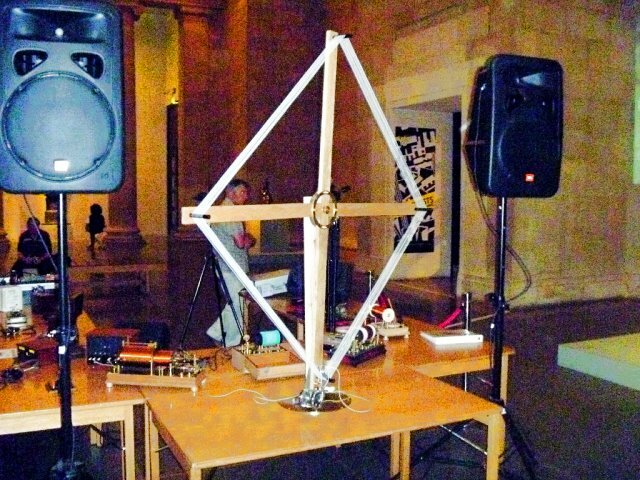 SWLing: What was your experience like at the Tate Britain’s crystal radio exhibition? Geoff: It was a wonderful and awe-inspiring experience recently to be invited to exhibit and actually operate some of my crystal receivers in the Tate Britain ‘Restless Times’ exhibition a couple of months ago. A feeling that I will relish for the rest of my life, and that will always give me fresh enthusiasm. SWLing: If I wanted to buy one of your crystal radios, where could I purchase one? 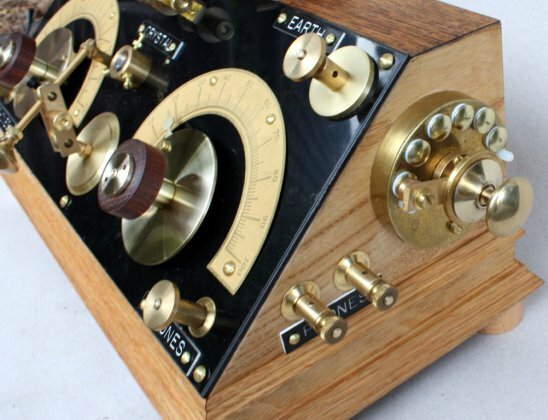 Geoff: I would be only too pleased to make a crystal receiver to order for you personally to your specification, or to my own design, and you can find full ordering details on my website or by emailing me direct…Thank you for listening to my little story. Geoff Roberts, G8DHI "Thank you for listening to my little story." SWLing: The pleasure was all mine. Thank you, sir, not only for bringing forward such a simple, magical technology, but doing so with such artistry and spirit. Best of luck! Geoff, you’re one cool guy. Thoroughly enjoyed the interview. Please do let us know when you finish “Frankenstein;” we’d love to publish some photos here, if we may–and warn the public, should it escape! Many, many thanks to @NW7US who led me to the website of Geoffrey Roberts–Geoff’s Crystal Receivers–and, in turn, to this delightful gentleman, artist, and ham. Sure you’d like him, too. This entry was posted in AM, Art, Articles, SWLers and tagged Crystal Radio, G8DHI, Geoff Roberts, Geoffrey Roberts, Interview, Interviews on October 7, 2011 by Thomas.